It was only a couple of days ago that I was able to enjoy my Thanksgiving break and not have to worry so much about schoolwork. Once I came back to school, I realized that finals were closer than I had expected. At this point in the semester, there are only two full weeks of school left which is the equivalent of 10 days. With that in mind, the finish line to ending the semester is so close! At the same time, it is very critical that you do not slack off in these last few days. Around this time, most professors will have several things due for instance, papers, presentations, projects, quizzes, and unit exams. When you are like me and take 18 (or more) credits worth of classes, people better start calling you a warrior. Do ANYTHING you can NOW. If you are a procrastinator, this message should be a valuable and handy tip. For those who do not procrastinate, this is a helpful message so you can relax later on and not have to be so stressed. With today being Wednesday, there is only 7 days left of the semester, it is best to use up all the free time you have to dedicate to your studies or obligated errands. Time is of the essence! Make a DAILY checklist. Many people underestimate the power of writing things down vs. memorizing things to do. Checklists help you stay very organized and forces you to finish specific things ON TIME. Without checklists, you may want to procrastinate, which is a no-no. Having daily checklists help you to think within a day’s time frame instead of view the week broadly. Plus, for me, it is quite satisfying to physically check off boxes and have a good feeling of accomplishment! COFFEE might be your new best friend. 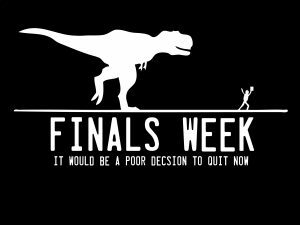 As we near finals week, there will definitely be a lot of assignments due and exams to study for. Coffee, if it is your preference, will provide you with an extra boost of energy and motivation to study more and focus. 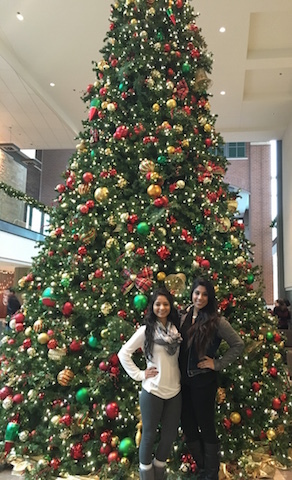 CHRISTMAS SPIRIT officially comes AFTER finals week. Unfortunately, this year we end the semester closer to Christmas than we normally tend to. However, that does not mean that you should direct your (full or partial) attention and focus away from your studies and schoolwork. This may affect you from boosting that B+ to an A… scenarios like this, people tend to regret not putting enough effort into their studying as they should have. If anything, go all out for New Years and celebrate hard; look forward to that holiday more than Christmas. If you are CONFUSED about anything, ASK. Asking does not hurt anyone. You will gain clarity on a certain topic and have more confidence when you are asked that topic on an exam. 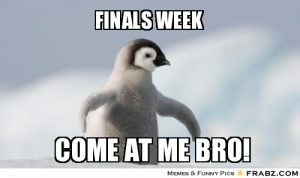 I understand that these things are leaning toward the more extreme and more self-disciplined methods to preparing for finals week, but nevertheless, they are ways to help you maintain or rise academically, which is the reason we go to school. We want to succeed, so we study for our classes by doing well on our exams and classwork. These all stem down to the basic essentials of how to study effectively and wisely. Finals are right around the corner, and with that a number of papers, presentations, and other course work are coming up out of nowhere. 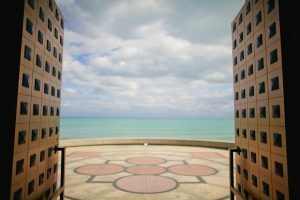 If this is your first semester at college, or if you’re just looking for some activities to keep yourself from going crazy with all the studying and work, there’s plenty of things around Loyola and throughout the city that definitely can be therapeutic for everyone at Loyola. 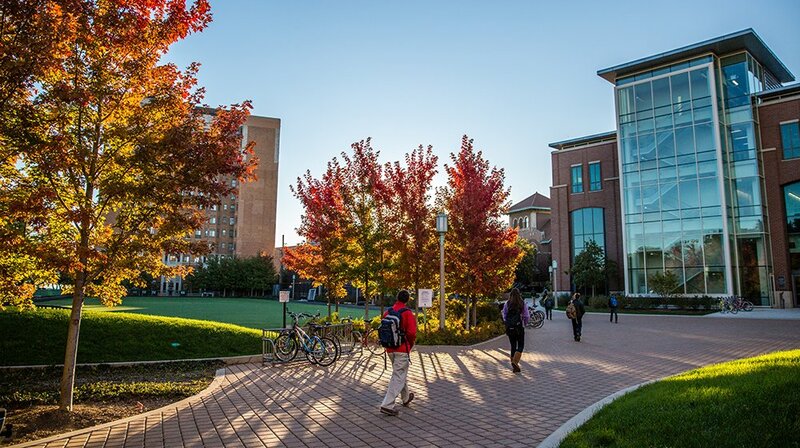 With finals, Loyola specifically has plenty of resources for our students to help them including tutoring for our students, with almost every class you might need help in, whether it be helping understand the material gone over in class, or bumping up that grade from a B+ to an A (x). Located in the IC, is also the Writing Center, aimed to improve all writing abilities, no matter if it’s your first semester, or your 8th semester (x). There’s also plenty of other activities around campus, as well as around Chicago to help destress if you need to get your mind off of studying. During Finals Week, finals breakfast is a well-known tradition for our Loyola students. Held in the Gentile Arena in the evening, our students can get a variety of things such as breakfast sandwiches, pancakes, fresh fruit, tater tots, bacon, as well as so many other things, entirely FREE! Those interested should definitely keep their eye out for an email on it. 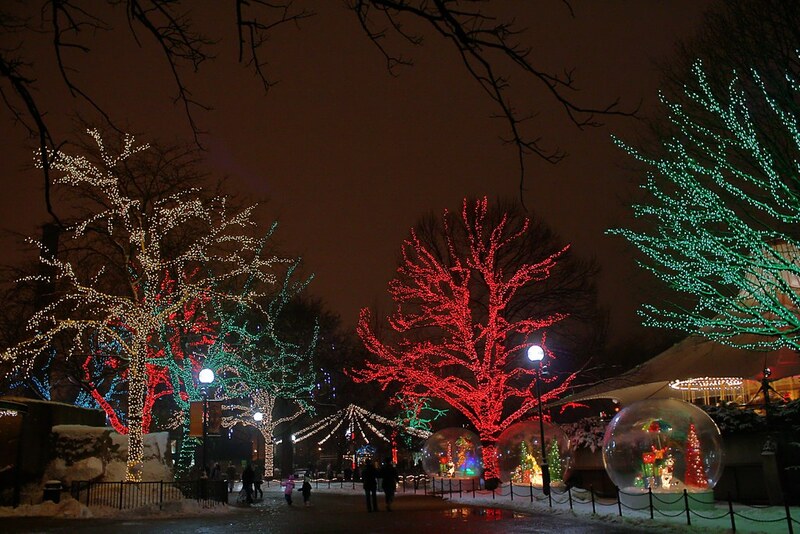 This weekend (Dec 3rd and 4th) from 12PM to 7PM both days is Polar Palooza. The admission fee is $5 per person and $10 per family. 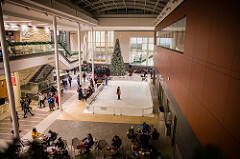 At the event there will be food from local restaurants, live music, synthetic skating, meeting Santa, gift shopping with local artisans, ice sculpting, family friendly activities, and a visit from a LIVE reindeer on Sunday! The event is held at 6100 N Sheridan (One block south of Granville). If that’s not your crowd, there’s also the Lincoln Park ZooLights with the entirety of Lincoln Park beautifully lit up for the holiday season. Dates still available to attend in Dec are 2–4, 9–23, 26–31 starting at 4:25PM, and if you’ll be in Chicago for New Years, their final day is January 1, 2017, 4:30–9PM. This event is entirely free for all participants. When you ask a Loyola student of what is iconic of our campus, many students will respond with Sister Jean or Tivo. Both are friendly, approachable, and know how to make your day so much better! During my freshman year, I was introduced to both of them. And, like so many other students, I felt sense of belonging and genuine compassion from each of them. Sister Jean Dolores Schmidt BVM: At least two to three times a week, I see Sister Jean smiling and walking around campus greeting students. I am fortunate to have been able to talk to her on many occasions whether it be for very casual greetings and conversations or just a wave of acknowledgment. 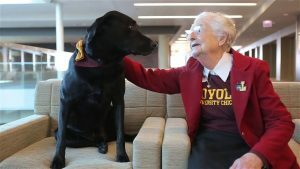 At 96 years old, she helps bring life to the campus by connecting with students and has an active role with campus life. For example, Sister Jean is the chaplain for the men’s basketball team and is also a chaplain/resident for Regis Residence Hall. During the basketball game, she is an active participant and is easy to spot, sporting her personalized Nike tennis shoes. However, her most important role is to bring the Rambler family together whether in times of fun/celebration or hardship. Weekly, she holds a prayer group at her apartment, bringing students together and reaching out to students. Wherever Sister Jean is on campus, she is highly valued here at Loyola! Tivo: Tivo is black lab that serves Loyola students as their therapy dog on campus. He resides in Loyola’s Wellness Center but is always found walking about campus or lounging in the Damen Student Center. Wherever he goes, students follow for a chance to pet him as their problems seem to wash away with every stroke of his fur. Did I also mention that he also loves to lick your hands? Many students who miss their pets at home are able to rent Tivo out for an hour (from the Wellness Center) and have the opportunity to play games and interact with him. Like Sister Jean, you can even find Tivo at the basketball games supporting our Ramblers. If you ever want to know where he is on certain days, be sure to follow him on Twitter! Thanksgiving break already? This semester seems like it’s breezed on by, with only a couple weeks left in the semester. (And a couple papers that I still haven’t started.) Realizing how quickly everything has flashed before my eyes gives me a great chance to finally reflect on this past semester. As a sophomore, I feel much more confident in thinking that I can handle the different aspects of college life, especially time management for a person such as myself. Still living on campus, and living with three other really great guys, that alone has helped improve my experience here at Loyola. From being able to cook meals with said roommates, to making random desserts such as brownies and cookies, to just being able to amass huge amounts of leftovers from all of the great Chicago restaurants, the sense of community hasn’t dissipated in the slightest for me. Including our neighbors, as well as our variety of friends from the others floors, as well as Campus Towers, just across the street. This year I’ve also had the pleasure and honor of working as a student ambassador, seeing such a large amount of potential students interested in Loyola. That experience has allowed me to reflect on everything that I’ve done around campus, from the classes I’ve taken and how hard our professors work, to every social event I’ve seen happening, and been a part of. I feel more proud to be a Rambler, once I think about how welcoming and open-minded Loyola is as a Jesuit Catholic institution. Speaking of our professors, this year since I’ve gotten even further in my studies, I’ve been able to witness first-hand how dedicated our professors are; not just to their area of study, but also to their students. 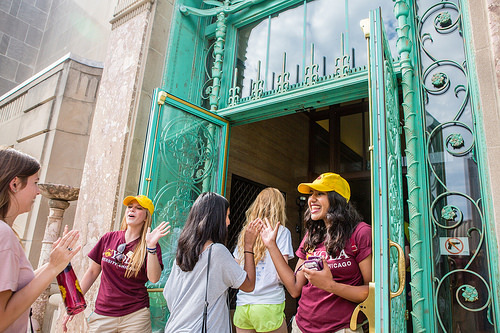 Consistently being open and as kind as they can be, they’ve helped make Loyola a great learning environment. One of my most recent encounters has been with my History professor, Professor Donoghue. His class that I’m taking focuses on Pirates and Sailors in the Atlantic in Caribbean. However, because I’m a massive history nerd and like to reenact in my spare time, I was curious to see if he had any resources for me to help one of my historical kits (French and Indian War, for those who’re wondering). And despite the topic having nothing to do with our class much at all, he was still able to not only suggest where to start looking, but also referred me to an old Grad student of his, who had done the very reenactment in depth. Such an occurrence isn’t uncommon here, where our professors try their hardest to ensure their students successful, and yearn to see them following their passions. Community is very prevalent here, which is why I’m definitely proud to call myself a Rambler. I’m not even halfway done with my adventure here, but with everything LUC does to make sure everyone feels safe and welcome, I want to continue to grow and develop as a scholar, as well as an individual, at a place that tries its best that I can do that on a professional level. So since Thanksgiving is right around the corner, I just want to say I’m definitely thankful I can be a part of a University that wants to see the world as a better place for all people, and take the initiative to do that. Ramblers Tie With Harvard for Top Mark in the Nation at 99%! 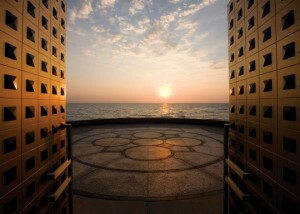 What an honor that Loyola University Chicago was one of only two NCAA Division I institutions to have a 99% Graduation Success Rate (GSR) according to National Collegiate Athletic Association (NCAA)! The 99% GSR tied with Harvard University for being highest in the country. 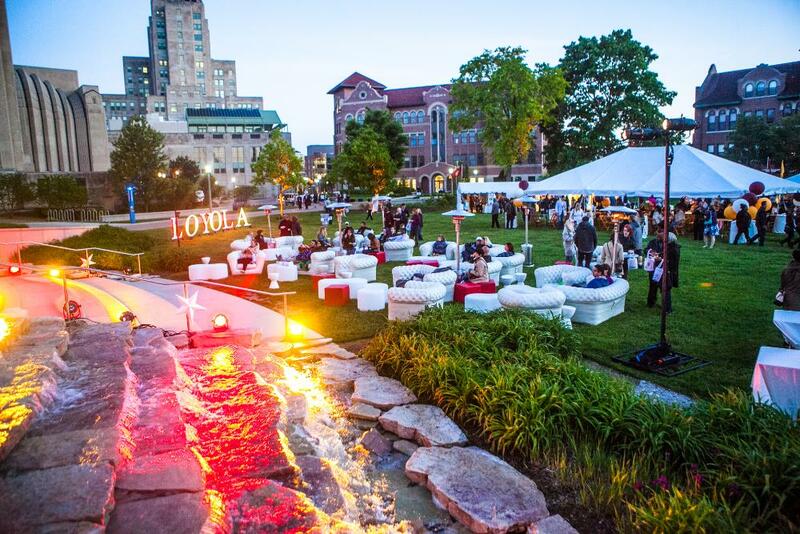 Nine of Loyola’s 11 programs recorded a perfect score of 100 in the latest GSR report. Women’s basketball, men’s and women’s volleyball, men’s and women’s golf, men’s and women’s cross country/track and field, women’s soccer and softball all scored 100. How awesome is it that the Men’s volleyball team had a perfect score of 100 and also at the same time competitively won back-to-back NCAA championships in 2014 and 2015! Developed to more accurately assess the academic success of student-athletes, the NCAA Graduation Success Rate takes into account transfers, unlike the federal graduation rate. 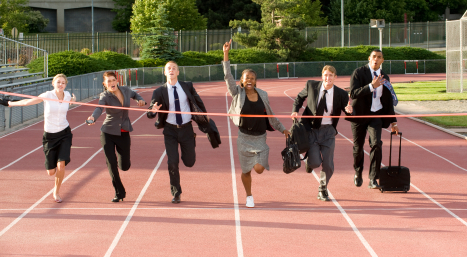 The GSR also accounts for midyear enrollees and is calculated for every sport. Under the calculation, institutions are not penalized for outgoing students who leave in good academic standing. 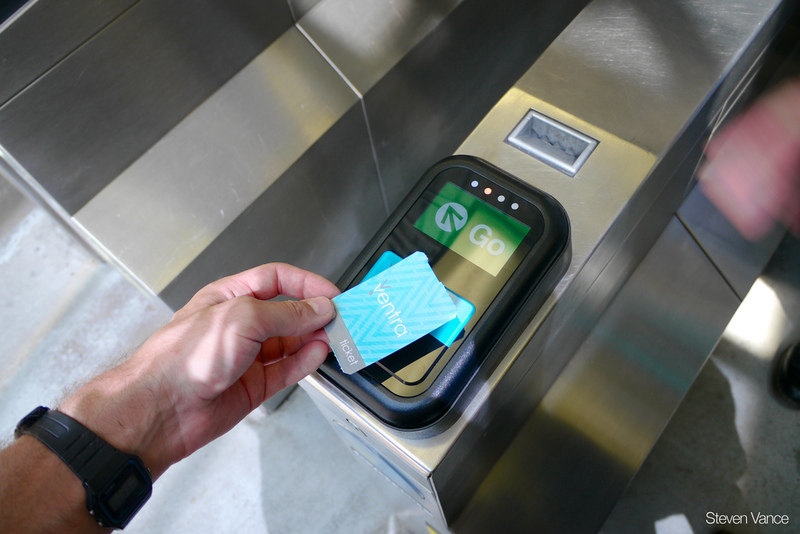 Outgoing transfers are included in the receiving institution’s GSR cohort. The most recent Division I Graduation Success Rates are based on the four entering classes from 2006-09. The NCAA began compiling these figures with the entering freshman class of 1995. 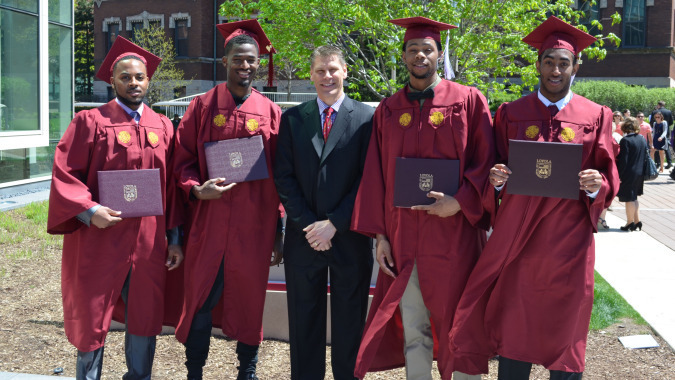 Lets give a shout out to our Ramblers! 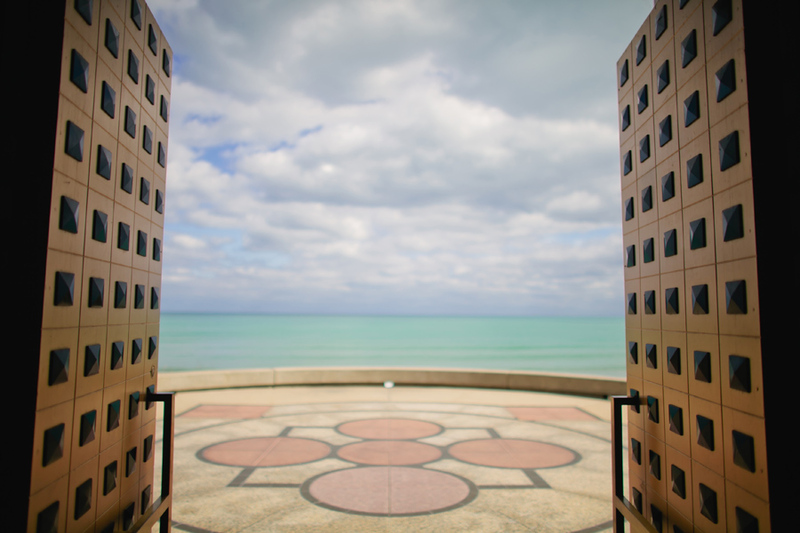 As this blog is primarily directed toward new, perspective students, it is possible that some of you have not visited our Lakeshore Campus yet or are not familiar with the area yet. Even if you took a tour of our campus, there are some things not mentioned on the tour regarding popular spots. Loyola’s Lakeshore Campus is quite large in size and we are very fortunate to take up a lot of the space right next to the lake. Since Loyola has a long history, with renovations and construction dating back to the early 1900s in this area, there are a lot of interesting facts about the buildings and general location too. (If you have been following us on Instagram, Facebook, and Twitter, you may have seen some of these facts on #throwbackthursday). Outside Palm Court (4th floor Mundelien). Here, you are on a balcony overseeing the majority of campus with the view of the lake in the background. 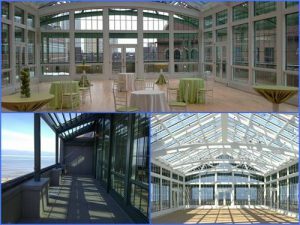 Needless to say, this place is quite beautiful- Palm Court can be used for wedding spaces, so you can imagine how nice this place looks already. East Quad (sometimes West Quad too). This place is usually calm, but when there is a need, people can come together here for various reasons such as protest or to support a cause. You can imagine the type of energy that can happen here when students come together. Atrium Area (located in the Damen Student Center). Everyday, there is always high energy here. Student organizations can set up tables to fund-raise, different offices can promote their services here, etc. St. Baldricks Head Shaving event is done here too as well as the ice skating rink and placement of Loyola’s Christmas tree. Convocation Doors. Besides the fancy intricate designs on this door, it is famously known for its purposes for when freshmen symbolically enter in and seniors walk out. Along with this tradition, students are given convocation keys. It is pretty meaningful and cool! The Chicago Hot Dog: This Chicago staple seems to have everything in it. On a poppy seed hot dog bun, the weiner is dressed up with tangy French mustard, chilled relish, sweet chopped onions, plump sliced red tomatoes, a pickle (that happens to be kosher), and a blend of peppers. This is truly a mouthful! Just a tip on the hot dog: DO NOT PUT KETCHUP ON YOUR HOT DOG! When in Chicago, do as the Chicagoan does. It is considered a grave sin to put ketchup on your dog and you will immediately be labeled as a tourist and not a true foodie. Regardless, this is a must eat. Having French fries or onion rings is always a nice addition to compliment this meal. 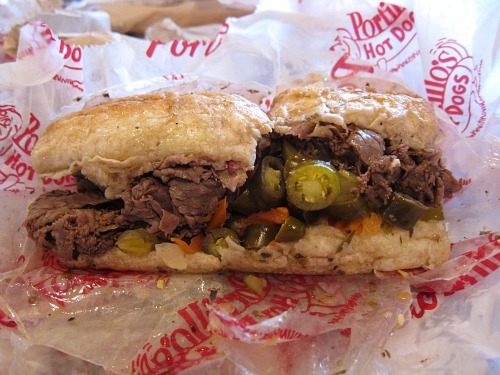 Italian Beef: Just like the signature hot dog, Italian beef is equally popular in Portillo’s. Here are the two most popular ways to eat this treat. Some people enjoy eating the beef and cheddar croissant which is beefy, cheesy goodness! All packed onto a flaky French croissant. Then, there is the “combo”. On a French roll, the combo is the best of both worlds: a juicy bratwurst and of course, Italian beef. This is also available with the sandwich dipped in its own sauce. Regardless, be sure to try the sandwich with either sweet peppers or spicier giadiniera peppers. I would highly recommend either of these! Chocolate Cake Shake: This decadent dessert seems to be the college student’s invention. As the name implies, a piece of chocolate cake is shoved in a blender with both milk and vanilla ice cream. I find this dessert to be a good way to “wash down” the greasy yet tasty food. In order to successfully consume this shake, it is more useful to have a spoon handy, as it practically impossible to use a straw. Want a Break From Classes? Time to Get in the Christmas Spirit! If you’re anything like me and you’re stressing about class registration and exams, you’re looking for a break to not think about classes at all. Chicago has that fix for everyone before–and after–Thanksgiving Break: Christkindlmarket! Running every day from this weekend, November 18th, to December 24th. The Christkindlmarket has been a Chicago tradition since 1996, with its design inspired by the 16th century Christkindlesmarkt in Nuremberg, Germany. Boasting both local and international German vendors, besides trinkets, Christmas ornaments, and wooden clocks, it’s a hotbed of traditional German culture, food, and spirits. With choirs singing Christmas songs as well as a traditional German brass band (depending on which day you attend), there’s never a gloomy day, even when the polar vortex rolls through. If food is what you’re looking through, there’s a number of European sweets, chocolates, and pastries, famed gingerbread (which is easily one of my favorites), to Bratwurst, soft pretzels, potato pancakes, crepes, and sauerkraut. Hot chocolate, cider, and beer (If you’re 21+), flows from every food vendor like a waterfall. With admission being free, it’s great for college students, and definitely where every Chicagoan can come together and celebrate holiday cheer, no matter who they are. If you’re looking for Christmas cheer and a good time with a couple friends (or a special someone), it can easily be a great place to spend a couple hours browsing all the shops, snacking on a brat-burger, and making some great memories. Christkindlmarket runs every day from Nov. 18th to Dec. 24th, on the Daley Plaza (Exit at State/Lake on the Red Line, walk south to Washington St., then walk west (headed away from Macy’s), and you’ll run into it in just a couple blocks!) The market opens daily at 11 am, closes at 8 pm Sunday-Thursday, then at 9 pm Friday and Saturday. See you there!